After spending a few days in the Southgate area of Melbourne, we moved over to Hotel Windsor, making for an easier commute to the University for The Professor. 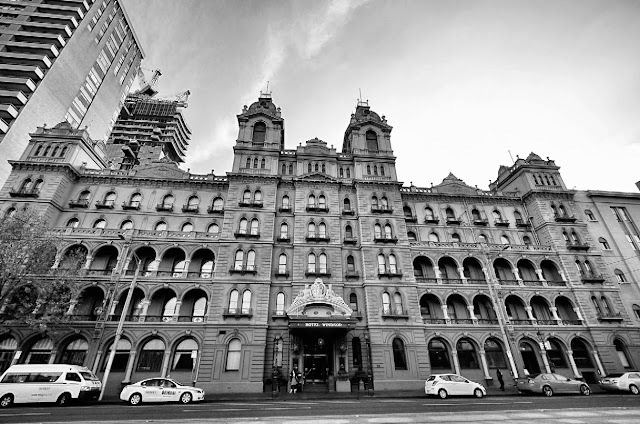 The Windsor is a landmark for its Victoria architecture and was the place where the Constitution of Australia was drafted in 1898. Mighty posh once upon a time, it was considered the most luxurious hotel in Melbourne, and favored by many notable folks as they so proudly display in their lobby. It was pretty cool to think that Kathryn Hepburn, Meryl Streep, Margaret Thatcher or Anthony Hopkins (whom I love!) walked these hallways at one time. Our stay was comfortable and the internet worked well, which is not the case everywhere! Some hotels restrict usage to only two devices using wi-fi ... ~sigh~). There has been much controversy over the last 40 years whether to demo or renovate this historic landmark. 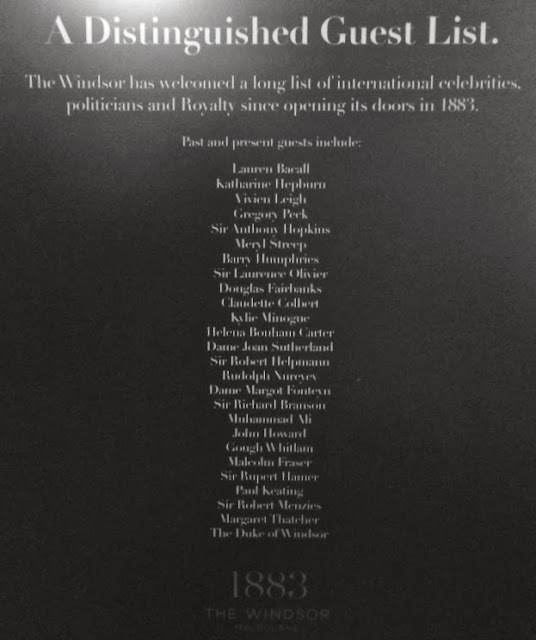 The Windsor's rooms are outdated and tired. Fortunately, all the squabbling over its historic significance has been settled and renovations are planned to begin in 2014. 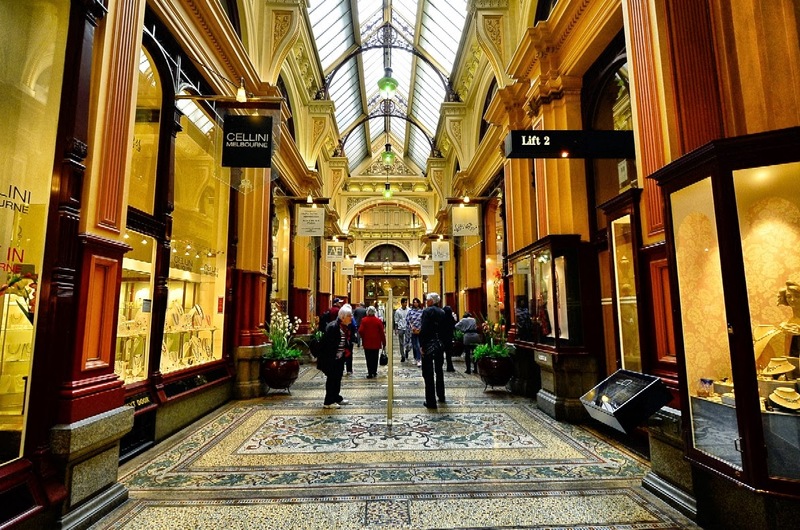 The Windsor did serve as a good location to explore other parts of Melbourne's central business district. 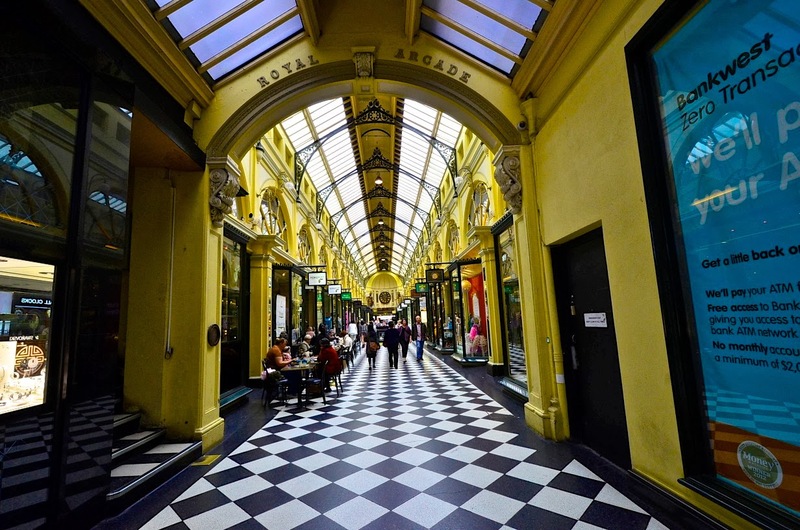 We spent an afternoon walking around the numerous lanes (streets), including The Royal Arcade and the Block Arcade, with their exquisite Victorian architecture, high end fashion shops, and eateries. 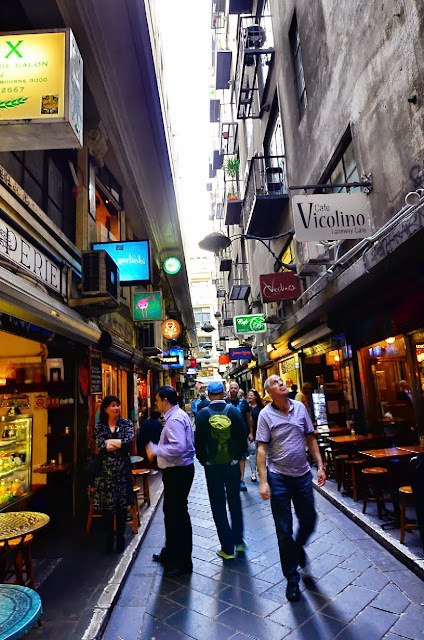 Apparently these lanes used to be service laneways for horses and carts. My, how things have evolved! We didn't go into any of the shops. I was more interested in the architecture than what was inside. 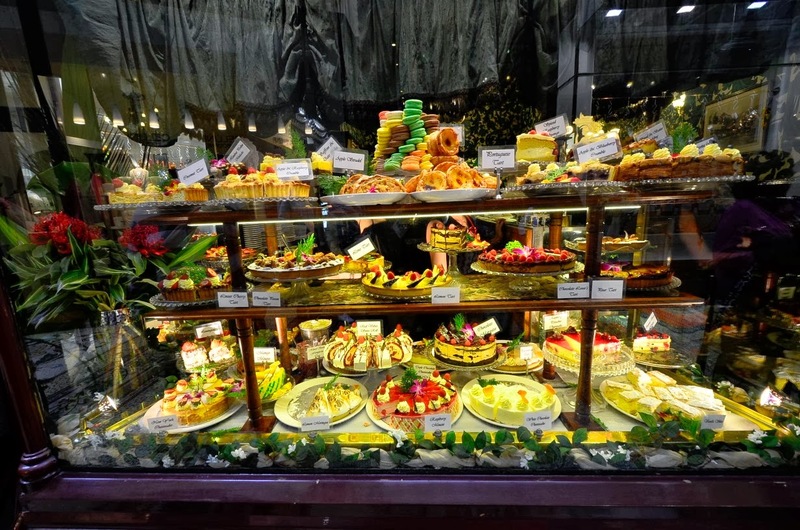 But we were almost drawn into a pastry shop if it wasn't for the line waiting for tea time. Oh, did they ever look so good! We had lunch at a little street deli. encouraging passerbys to come in. Later, we caught the tram and headed over to another section of town called the Docklands, an old network of wharfs which fell into disarray until being revitalized over the last two decades, now a sought after business district. 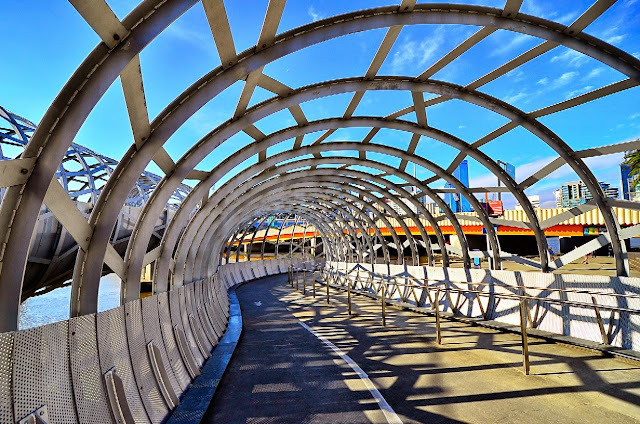 It is there that the Webb Bridge, a pedestrian/cycle bridge over the Yarra River, connects the business district and residential areas of the Docklands. Its spider-like web framework was a Melbourne public art project, continuing the urban art theme in the Docklands. 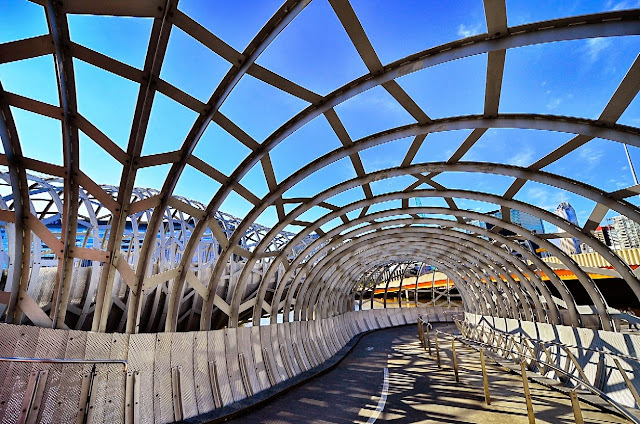 The sculptor imagined it as a Koori (indigenous Australians) eel trap, which I have no idea what one looks like but it was most certainly a delightful place to wander through, floating above the Yarri River. As we were ending our day, I was lucky enough to capture this rower. And with that, this is a wrap. Next up ... bath houses! Have a safe and candy-filled Halloween! Mz preferred hotel in Melbourne too. 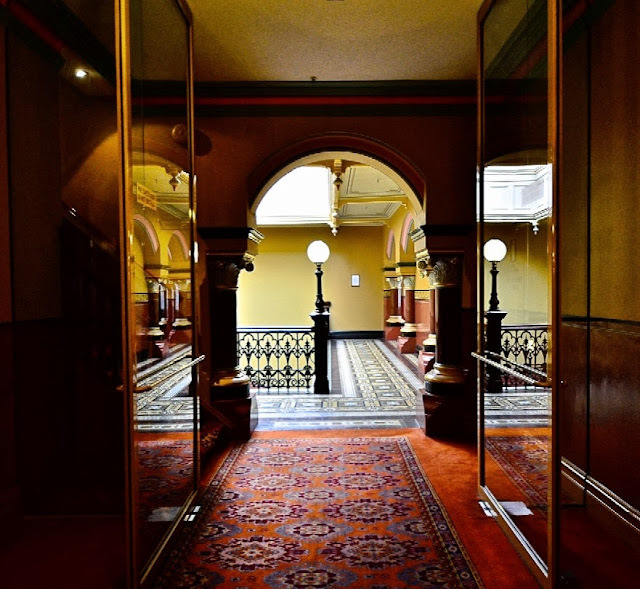 I like to stay in a 'Parliamentary room' that looks out to Parliament house and the parklands. luckily it still has some of the Victorian charm about it. Glad you enjoyed it too. What a beautiful hotel. I hope they stay true to its original look with their renovations. 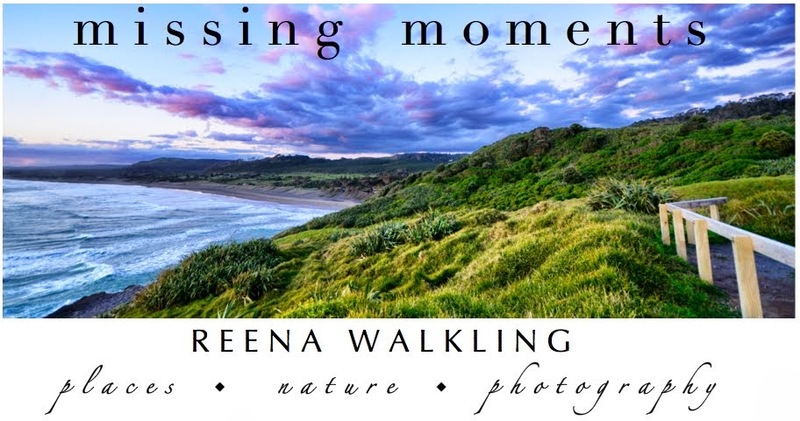 You have some wonderful images here, Reena. But of course you always do. An interesting post, thank you. Look forward to more like it. 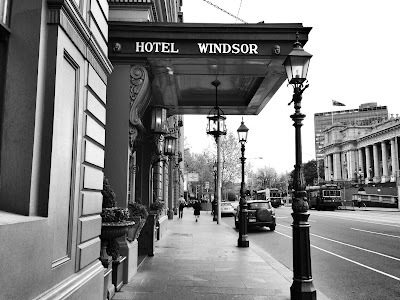 The Windsor is a beautiful, historic establishment. 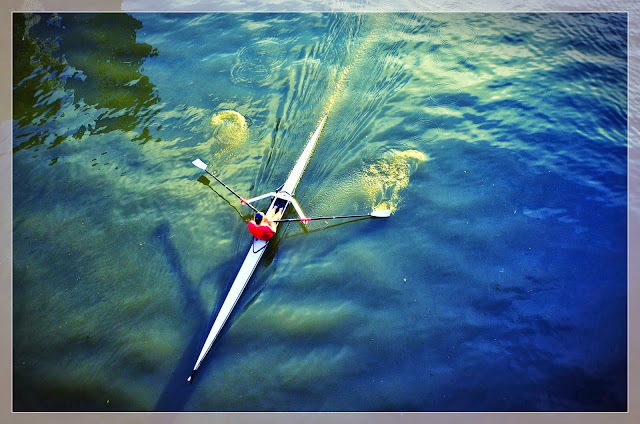 Interesting post and terrific photos, Reena! They're the next best thing to being there!! Thanks for sharing the fun and the beauty!. I'm ready to visit the pastry shop right now!! Guess I'd better go have some breakfast before i drool on my desk! Great series, Reena! 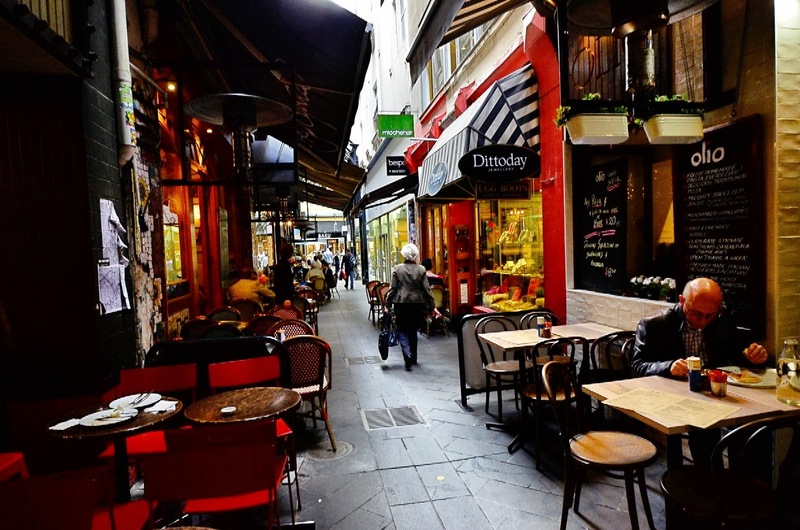 I love the outdoor cafes! Have a great day! Love that last shot! Melbourne looks lovely. love the b&w .. love the whole thing .. Such a cool bridge design! I'm really glad that they've decided to restore that amazingly beautiful old building. I LOVE all your photos in this post. If I had to choose just one as my favorite....I couldn't!